You'll have to pass a written test on safely crossing railroad crossings. Railroad-highway crossings can also cause problems, particularly when pulling trailers with low underneath clearance. These trailers can get stuck on raised crossings; Low slung units (lowboy, car carrier, moving van, possum-belly livestock trailer), Single-axle tractors pulling a long trailer with its landing gear set to accommodate a tandem-axle tractor. Question 01. 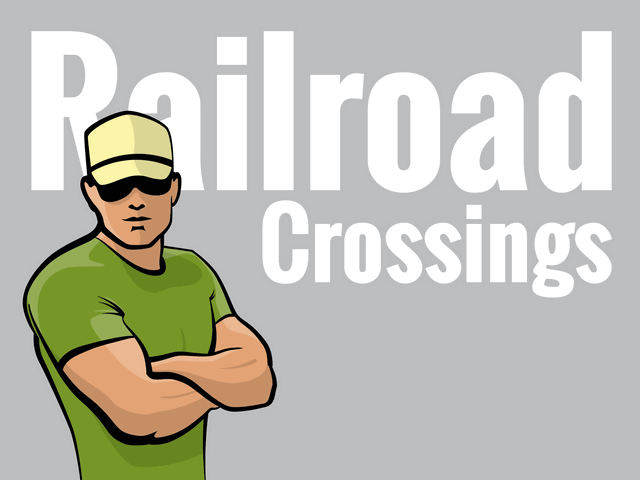 Which of the following statements about Passive Railroad Crossings is true? They do not have any traffic control devices. All answers are correct. Passive Railroad Crossings do not have any traffic control devices. They do have Yellow circular advance warning signs, pavement markings and cross bucks. The decision to stop or proceed is yours. They do have Yellow circular advance warning signs, pavement markings and cross bucks. The decision to stop or proceed is yours. Question 02. Which statement about Passive Railroad Crossings is true? This type of crossing does not have any type of traffic control device. Correct. A passive crossing does not have any type of traffic control device. The decision to stop or proceed rests entirely in your hands. This type of crossing has a traffic control device installed at the crossing to regulate traffic at the crossing. Incorrect. A passive crossing does not have any type of traffic control device. The decision to stop or proceed rests entirely in your hands. The cross buck sign has flashing red lights and bells. Question 03. Active Railroad Crossings have flashing red lights. They may also have bells. Correct. Active Railroad Crossings have flashing red lights. They may also have bells. Incorrect. Active Railroad Crossings have flashing red lights. They may also have bells. Question 04. Which of the following is an examples of an Advance Warning Signal seen at an active railroad crossing? Correct. All are examples of an advance warning signal device. The nature of the cargo makes a stop necessary. Correct. A full stop is required when the nature of the cargo makes a stop necessary. It is never safe to stop on a highway. Incorrect. A full stop is required when the nature of the cargo makes a stop necessary. Question 06. Which of the following types of trailers would be more likely to get stuck on a raised railroad crossing? Incorrect. Because of lower ground clearance a Low Boy trailer would be more likely to get stuck on an elevated railroad crossing. Correct! because of lower ground clearance a Low Boy trailer would be more likely to get stuck on an elevated railroad crossing. Question 07. It takes a typical tractor trailer unit 14 seconds to clear a single railroad track. Correct. It takes a typical tractor trailer unit 14 seconds to clear a single railroad track. Incorrect. It takes a typical tractor trailer unit 14 seconds to clear a single railroad track. Railroad-highway Grade Crossings are a special kind of intersection where the roadway crosses train tracks. These crossings are always dangerous. Every such crossing must be approached with the expectation that a train is coming. Types of Crossings Passive crossings. This type of crossing does not have any type of traffic control device. The decision to stop, or proceed, rests entirely in your hands. Passive crossings require you to recognize the crossing, search for any train using the tracks, and decide if there is sufficient clear space to cross safely. Passive crossings have yellow, circular, advanced warning signs, pavement markings, and crossbucks to assist you in recognizing a crossing. Active Crossings. This type of crossing has a traffic control device installed at the crossing to regulate traffic at the crossing. These active devices include flashing red lights, with or without bells, and flashing red lights with bells and gates. Warning Signs and Devices Advance Warning Signs. The round, black-on-yellow warning sign is placed ahead of a public railroad-highway crossing. The advanced warning sign, tells you to slow down, look and listen for a train, and be prepared to stop at the tracks if a train is coming. Pavement Markings. Pavement markings mean the same as the advanced warning sign. They consist of an "X" with the letters "RR" and a no-passing marking on two-lane roads. See Figure 2.16. There is also a No Passing Zone sign on two-lane roads. There maybe a white stop line painted on the pavement before the real road tracks. The front of the school bus must remain behind this line while stopped at the crossing. Crossbuck Signs. This sign marks the grade crossing. It requires you to yield the right of way to the train. If there's no white line painted on the pavement, you must stop the bus before the crossbuck sign. When the road crosses over more than one set of tracks, a sign below the crossbuck indicates the number of tracks. Flashing red light signals. At many highway rail grade crossings, the crossbuck sign has flashing red lights and bells. When the lights begin to flash, stop! A train is approaching. You're required to yield the right of way to the train. If there's more than one track, make sure all tracks are clear before crossing. Driving Procedures Never Race a Train to a Crossing. Never attempt to race a train to a crossing. It is extremely difficult to judge the speed of an approaching train. Reduce Speed. Speed must be reduced in accordance with your ability to see approaching trains in any direction, and speed must be held to a point which will permit you to stop short of the tracks, in case a stop is necessary. Do not Expect to Hear a Train. Because of noise inside your vehicle, you cannot expect to hear the train horn, until the train is dangerously close to the crossing. Do not Rely on Signals. You should not rely solely upon the presence of a warning signal, gate or flagmen, to warn of the approach of trains. Be especially alert to crossings that do not have gates or flashing red signals. Double Tracks Require a Double Check. Remember that a train on one track may hide a train on the other track. Look both ways before crossing. After one train has cleared the crossing, be sure no other trains are near before starting across the tracks. Yard Areas and Grade Crossings in cities and towns. Yard areas and grade crossings in cities and towns are just as dangerous as rural grade crossings. Approach them with as much caution. Stopping Safely at railroad-highway crossings A full stop is required at grade crossings whenever the nature of the cargo makes a stop mandatory under state or federal regulations. Such a stop is otherwise required by law. When stopping, be sure to check for traffic behind you while stopping gradually. Use a pullout lane if available. Turn on your four-way emergency flashers. Crossing the Tracks Railroad crossings with steep approaches can cause your unit to hang up on the tracks. Never permit traffic conditions to trap you in a position where you have to stop on the tracks. Be sure you can get all the way across the tracks, before you start across. It takes a typical tracker trailer unit at least 14 seconds to clear a single track, and more than 15 seconds to clear a double track. Do not shift gears while crossing railroad tracks. Special Situations Be Aware! These trailers can get stuck on raised crossing. Low-slung units, lowboy, moving van, possum-belly livestock truck trailer, single axle trailer pulling a long trailer with its landing gear set to accommodate a tandem-axle tractor. If for any reason you get stuck on the tracks, get out of the vehicle, and away from the tracks. Check signposts or signal housing at the crossing for emergency notification information. Call 911 or other emergency number. Give the location of the crossing using all identifiable landmarks, especially the DOT number, if posted.